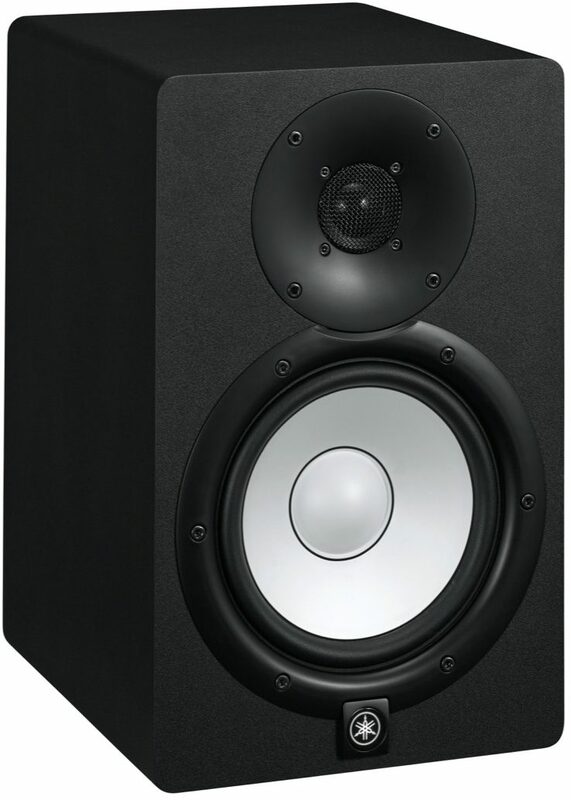 The Yamaha HS7 Active Studio Monitor is the happy middle child in the much-acclaimed HS line of powered speakers! The price point delivers a power rating of 95 watts, which puts the HS7 right between the HS5 and HS8 in terms of output power. Yamaha's all-proprietary design yields an exceptional tonal response and presents dynamic fidelity sufficient for the demands of a professional mixing session. The HS7 monitors are of true bi-amp design, and drive all the way to maximum output without clipping or distortion, while preserving accurate dynamic ratios. Like the rest of the HS line, the HS7s benefit from revolutionary cabinet design. For inspiration in rethinking the HS7's housing, Yamaha drew on their 100 justly celebrated years of piano design. And from their pianos, they developed a three-way mitered-joint technique for these cabinets. This makes them not only minimally cross-resonant, but extremely durable as well. The attractive white 6.5-inch cone woofer and 1-inch black dome tweeter in the HS7s sit in a uniquely redesigned mounting ring that eliminates any undesirable vibrations. Each monitor also employs an extra-large magnet, creating a more uniform flux field. This yields a smooth response and greater dynamic capability over a wider frequency range. The magnets themselves are selected to provide the greater possible fidelity in the low-end frequencies, which is typically the hardest range to manage when mixing audio. The tweeter frames in turn are built extra thick, minimizing interference in the high end. 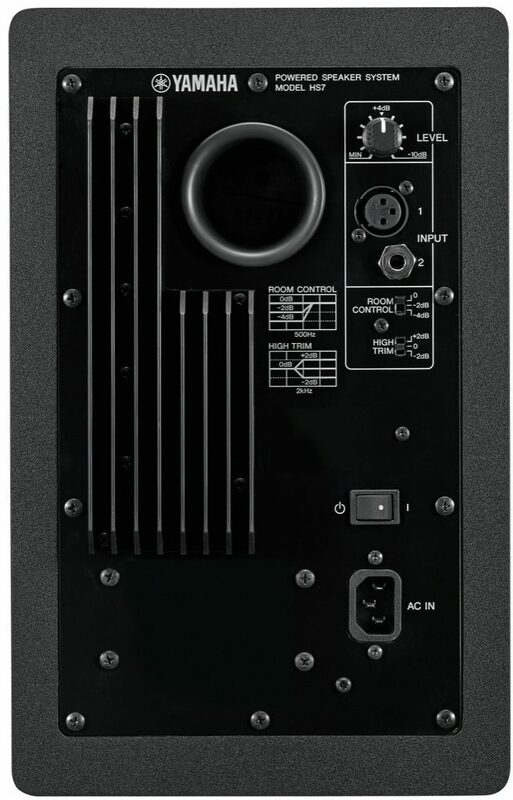 The HS7's 2-way bi-amplified designed means that the woofer and tweeter are powered by separate amps. This eliminates undesirable interaction between the units, and any signal distortion resulting from phase difference. 5.1 and 7.1 surround systems are continuing to become more commonplace in public and private music listening settings. The HS7 is a premium solution for building out your surround mixing station. Combine a set of four or six HS7s with a single HS10W subwoofers and you'll be ready to start mixing multi-channel! Apart from the design of a monitor, the single greatest factor influencing accuracy is the room where they're located. Room size, shape, and surface materials all affect what you're hearing during playback. The HS7 gives you Room Control, Mid EQ, and High Trim controls for good room-matching. You'll tweak the Room Control setting to compensate for any unnaturally exaggerated low end. Then you'll use Mid EQ and High Trim switches to get your mids and highs in the right place. The Yamaha HS7 is a 2-way bass-reflex bi-amplified near field studio monitor with 6.5" cone woofer and 1" dome tweeter. HS Series cabinets are designed to eliminate unwanted resonance and increase the accuracy of sound reproduction to their extreme limit. Drawing from Yamaha's over 100 years of piano design experience, HS Series engineers also employed a traditional three-way mitered-joint technique to dramatically improve durability and eliminate unwanted resonance. When choosing reference monitors for mixing and music production, accuracy is the prime consideration. Speakers that sound "good" on first impression may not necessarily be accurate. What you really need is an honest reference for your mix, rather than monitors that have been tweaked or colored to deceptively sound impressive. The HS series reference monitors have been created by Yamaha's studio monitor engineering team to deliver exceptionally flat, accurate response that you can trust. Unlike "monitor" speakers with exaggerated bass and treble that make a good first impression but can't be relied on for accuracy, the HS series were designed to be true studio reference monitors in the tradition of the legendary Yamaha NS10M. 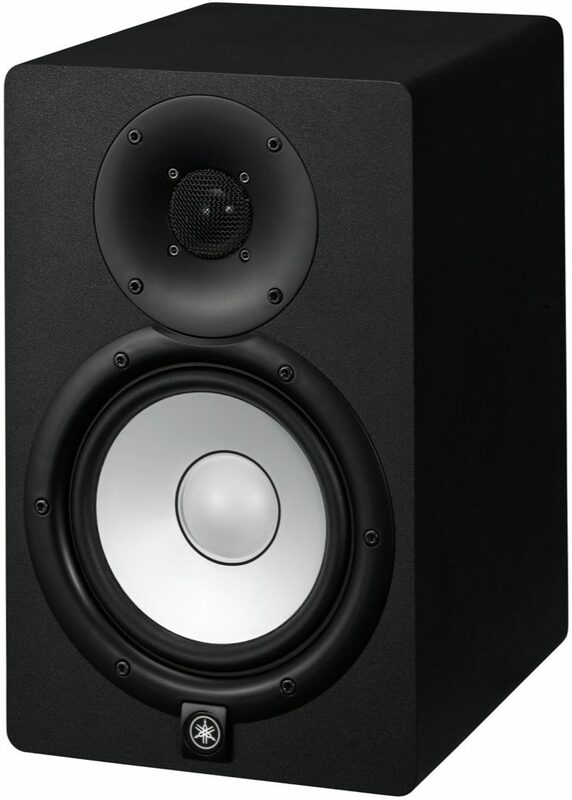 Whether you're mixing for stereo or 5.1 surround, mixes that sound good on Yamaha HS series reference monitors will translate accurately to the widest possible range of reproduction systems ... which is engineer-speak that simply means they'll sound good on anything. And that is the ultimate goal of any reference monitor. It's also worth mentioning that the HS-series monitors not only sound great, they look great, too. The elegant white-cone speakers used in the HS-series monitors deliver superlative audio performance that is further enhanced by a carefully engineered mounting system. A system of screws and a specially designed mounting ring eliminates spurious vibration and resonance, allowing the speaker to deliver its full sonic potential. Another feature that boosts woofer performance is a magnet selected to produce accurate, solid low-end response. The tweeter frames employ an advanced smooth-contour design that minimizes losses so that high-frequency details come through with remarkable accuracy. The extra thickness of the tweeter frame also minimizes resonance that can interfere with high-end clarity. The overall result is extraordinarily smooth, accurate response throughout the audio spectrum. 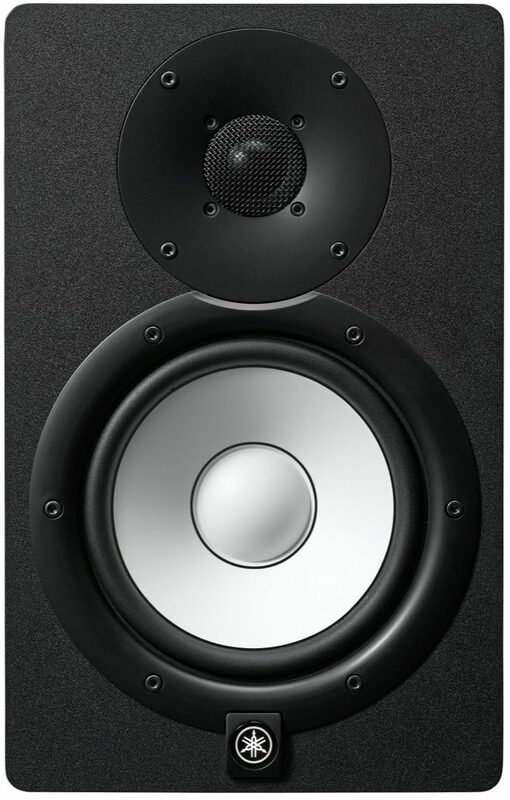 One feature of the HS-series monitors that you'll hear but are not likely to see is the extra large magnets. In combination with an advanced magnetic circuit design these magnets provide a powerful, uniform, tightly controlled flux field that results in exceptionally smooth response and dynamic capability over a wider frequency range. All you really need for top-class stereo production capability is a good audio workstation and a pair of HS-series monitors. A system like this is not only portable and extremely easy to set up anywhere you need it, it can deliver outstanding monitoring performance that will let you get your mixes just right. The response-control features of these monitors let you tweak them for the best response no matter where you set them up. Although stereo is still the most common format for basic music listening, 5.1 surround has become the audio format of choice for today's advanced visual media, and is beginning to be recognized as a superior vehicle for pure musical enjoyment as well. But to properly mix and produce surround sound you need a good 5.1 monitoring system. The HS-series speakers and subwoofer are the perfect choice if you want competitive surround-monitoring performance without having to spend big-studio megabucks to get it. Combine five HS50M or HS80M powered near-field reference monitors with one or more HS10W subwoofers, and you're ready to produce and deliver state-of-the-art surround sound. Speaker response can vary greatly depending on the size, shape, and surface acoustics of the room in which they're used, as well as how they're placed within that environment. The HS50M and HS80M give you extra room-matching and speaker placement versatility with ROOM CONTROL, MID EQ, and HIGH TRIM response control switches that are specifically designed to compensate for common acoustic deficiencies and monitoring needs. The ROOM CONTROL switch, for example, can be used to compensate for the unnatural low-end exaggeration that usually occurs when speakers are placed close to walls or in corners. The MID EQ switch gives you subtle midrange boost and cut options in addition to flat response, while the HIGH TRIM switch offer the same type of response-tailoring capability for the high frequencies. Overall: So I love these monitors, mainly because not only do they sound really nice but they look really nice. The bass is really clean, but my only complaint is the light at the bottom (the logo) is a bit to bright. i mean its brigher than my laptop and it can get bright. but overall these are the best monitors for the price. I used krks and didnt like them for one the sub gave out and ruptured on me. and two the excessive bass it has. I also used jbls, now jbls are nice but more to listen to than to make music off of or mix. So to put it in short buy the yamahas but just be weary of the super bright lights. 12 of 14 people (85.71%) found this review helpful. Did you?